Hinata has an unusually high ability to jump. Since he was young, Hinata trained his legs to compensate for his lack of height. He joins Karusuno High School Volleyball team and amazes the team with his natural affinity as a spiker. Although he is a complete beginner and never had any experience playing in a volleyball team, he grows rapidly through each match. Hinata has a cheerful and energetic personality. He's a natural schmoozer and his teammates would sometimes use him to win someone over, such as Nishinoya. Hinata gets excited easily and often talks loudly. He is the loudest member after Nishinoya and Tanaka. He is friendly and can befriend anyone easily, such as Kenma from Nekoma High and Aone from Date Tech High. 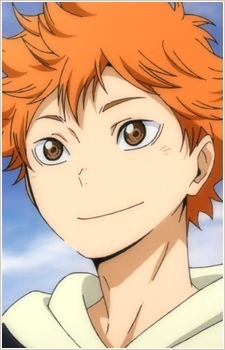 Despite his easy-going personality, Hinata is extremely competitive, especially when it comes to volleyball. As stated by Sugawara, Hinata has a very big fortitude to win and thus, doesn't give up easily during a match no matter if it's a practice match or a real match. Hinata can also exhibit a very scary and intimidating face when people underestimate him. Despite that, Hinata gets scared easily, especially by larger and stronger opponents. However, he recovers quickly and will then confidently challenge the opponents.